The best non-toxic odorless cement on the market. 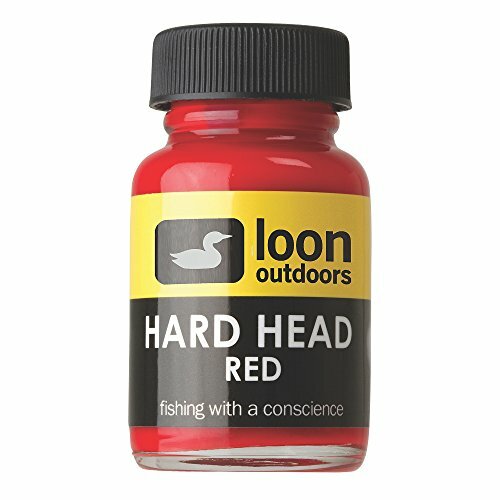 Loon's Hard Head Fly Finish replaces messy epoxies in most applications, and is perfect for building colorful, glossy heads and bodies easily. Comes in a variety of colors and shimmers making it easy to create just the fly you want. 4.Hold wrapped line in place with finger. 5.Take the tail of the line and feed it through the wraps. 6.Insert fly line through opposite end of wraps. 7.Hold both lines on thumb rest. 8.Give a firm tug on line. 9.Pull leader to further tighten knot. Durable stainless steel construction, 4 in 1 consolidates design in an easy to use tool. Easy to use nail knot tools come with a zinger can easily fit in a pocket. KNOT TYING KIT - An easy-to-learn knot tying kit designed to guide you through the most important knots that every outdoor enthusiast should know. Perfect for backpacking, camping, fishing, hiking, climbing, survival and more! 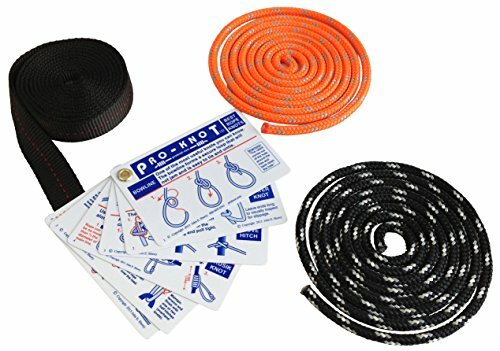 Our kit includes two 6 foot lengths of double-braided polyester rope, one 6 foot length of tubular nylon webbing, and 17 waterproof instructional cards. SUPERIOR ROPES - Our practice ropes are made of nylon and polyester, two of the strongest and most versatile synthetic cord materials on the market. Nylon and poly fibers are resistant to moisture, weather, sunlight / UV rays, chemicals, and abrasion. 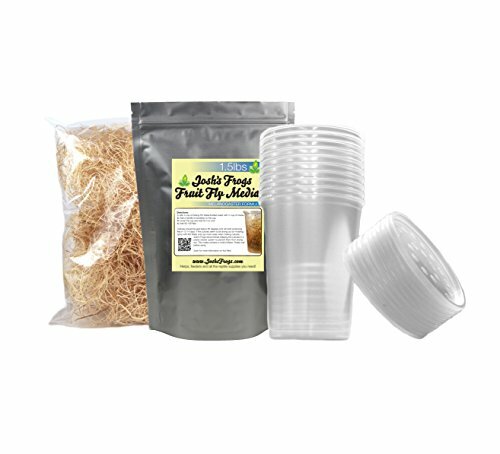 Making both rope materials ideal for many indoor and outdoor applications. Learn about each material and its different benefits. Nylon is softer and stronger than polyester. While polyester is fast-drying and features better abrasion resistance. LENGTH / WIDTH / COLOR - You will receive three 6 foot lengths of rope with widths of 3/16 inch (rope) and 1 inch (webbing). The webbing is black, and the ropes are orange (with a gray tracer), and black (with a white tracer). VETERAN OWNED and OPERATED - Knot Tying Kit made in the USA. Just like the Marine Corps, SGT KNOTS is committed to being the best of the best. We continue to live by the motto, Semper Fidelis-Always Faithful. Our loyalty to our customers is what makes us who we are, and the reason we continue to grow in popularity and product offerings. We promise to maintain the strength and consistency of our products. We also pass down our bulk savings to our customers. What are you waiting for? Take this SAMSFX fishing multi-tool to go fishing immediately, it will bring you more luck! The Standard Fly Tying Tool Kit makes a great addition to any fly makers arsenal of tools and also makes a great gift. Features of using acetate floss to make hard plastic-like bodies for ants and bugs. Simply wrap the acetate floss around your hook of choice and put a drop or two of acetone on it. Acetone melts the floss and leaves a hard body on the hook. Many use this floss to tie feathered treble hooks. 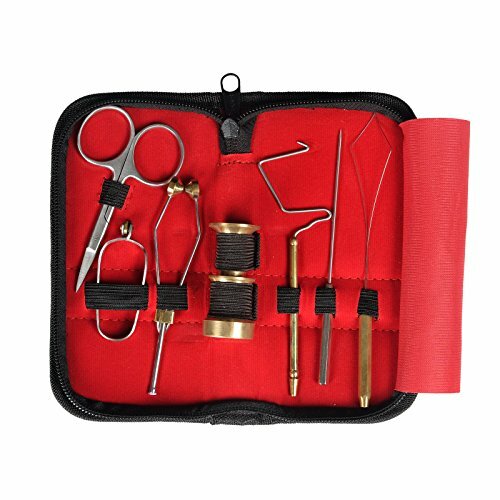 1.The Standard Fly Tying Tool Kit includes quality fly tying tools perfect for the beginner and the seasoned fly tyer alike. 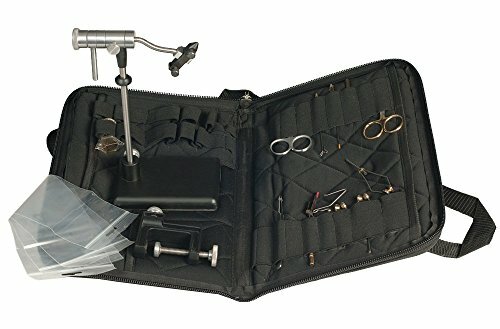 3.This Fly Tying Kit has everything needed to create effective dry flies, wet flies, nymphs, and streamers. 4.Everything you need to start tying your own flies is included in an attractive bag. Great way to get started! 5.The Standard Fly Tying Tool Kit makes a great addition to any fly tyers arsenal of tools and also makes a great gift. 2. An essential fly tying tool. 4. 5.5 inches. Jumbo Handle is 7 Inches Long and 10mm in Diameter. SF ergonomically designed for easy handling. Swivel tubed handle rotates smoothly, allowing for quick and easy tie-off. 4.5in length suits most hook sizes. 2.Made of high grade surgical stainless steel. Bobbins are the critical tool in tying since they must keep smooth tension on the thread spool and have super smooth inserts to apply the thread to your fly.To this end, we have created two series of bobbins that handle these tasks with ease. Both series have delrin feet for smooth tension on the thread spool and have either dual ceramic or titanium oxide funnel inserts for smooth application of thread to fly. These funnel shaped inserts allow for a smoother application of thread as the bobbin is rotated and they cause less breakage than traditional pipe or straight edged inserts. SF scissors are the choice of fly tyers worldwide. Whether you re new to fly tying or a hardened production tyer, SF scissors will maximize your fly tying enjoyment, production and quality. Each scissor is inspected, adjusted and tested before leaving the Dr. Slick shop, assuring you a tool that won't fail on the bench. 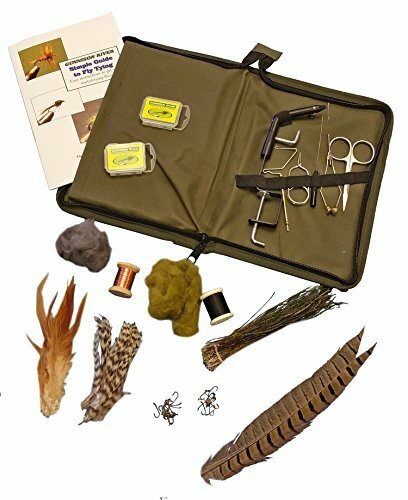 WETFLY Deluxe Fly Tying Kit with Book and Dvd. 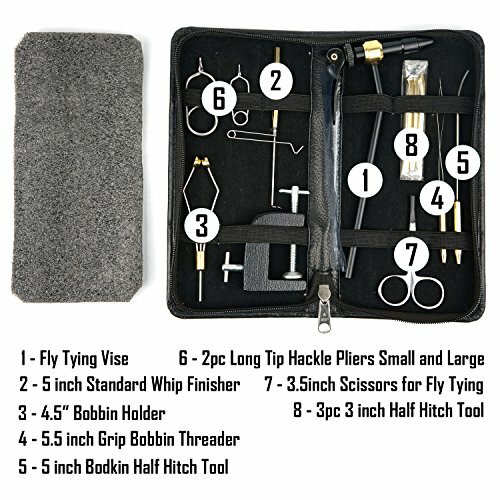 This Is Our Most Popular Fly Tying Kit. This Deluxe Fly Tying Kit is very versatile, perfect for the beginner to the intermediate tier. 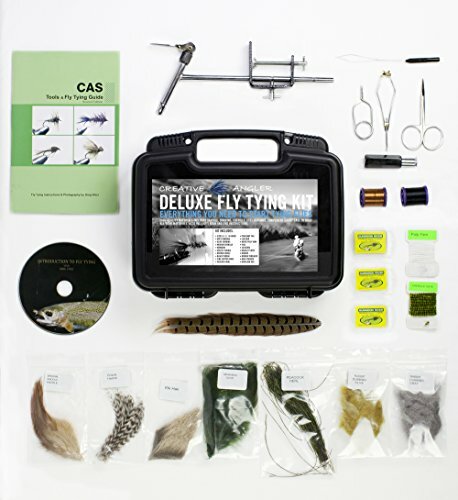 Creative Angler Deluxe Fly Tying Kit is our best selling Fly Tying Kit. Are you looking for the best fly tying kit money can buy? The Creative Angler Deluxe Fly Tying Kit may be just what you are looking for. 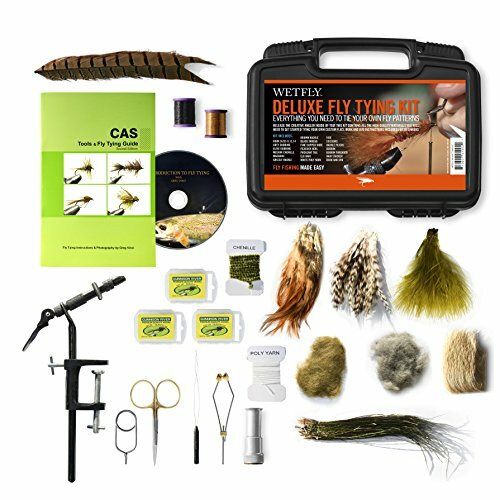 This kit features both an instructional DVD and illustrated book covering basic fly tying techniques as well as step by step instructions on how to tie several fly patterns that you can tie with the provided materials. The kit includes a standard fixed jaw vise with a C-clamp. 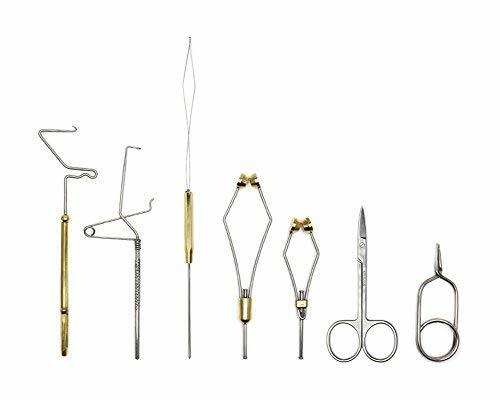 Selected collection of exceptionally built fly tying tools. Prime quality tools which comes from High-precision factory, Innovative design, great functionality, solid construction and precision engineering of these tools have impressed even the most selective tyers. 1.You get the most essential fly tying tools geared toward both the novice and the expert fly tyer all in one set. 3.These tools are built so anyone, from the entry level to the professional tying masters, will find them super functional and convenient. 4.Top quality fly tying performance to any bench. This tying kit is soft-sided for expandability. High quality graphite blank. Strong, blank-through-handle construction. 6'6", 1 piece. Medium Heavy action. 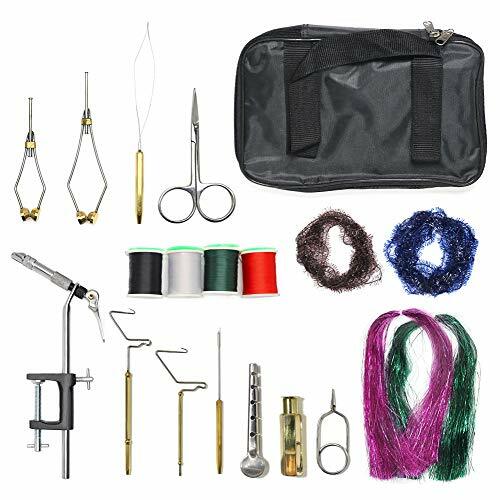 Brand: Colorado Anglers | Manufacturer: Sportsman Supply Inc.
Great Value and Quality fly tying tool combo kit packed in a decent easy carry bag. Use our tools will maximize your fly tying enjoyment, production and quality. 8 type total 11 tools included. It is easy and reliable for fly tying. Its super strong high carbon steel tapered jaw, easy and secure fitting all sizes fly hooks. Brass handle, stainless steel wire, 5 inch in total length. It is used to finish off a fly and tie a knot at the head. Use it, the fly does not come unraveled when you fly casting it. Brass and High-carbon Stainles. It holds your fly-tying thread. If you aren't one of the magicians who tie in the hands with no tools, you need it to hold that bobbin. Brass handle, stainless steel wire on jumbo, 5.5 inch in total length. Excellent tool for pulling your thread through the bobbin tube. Brass handle with stainless steel wire, around 5 inch in total length. It allows precise placement of cement droplets or picking dubbing fibers or other UV glue materials to get a realistic look. The bottom of the handle also has a large hole for a half hitch tool, ideally suited to knot work. 2pc long tip hackle pliers one large 2.4 inch and one small 2 inch. They are very easy to use. These pliers grip the tips of hackle feather making it easy to wind the feather around the hook shank then hold it tightly so it can be tied in place. It can get into tight corners and fly heads, and hackles and wings and trim foam bodies too, when you fly tying. They are unique taperedapplies to knot the flies. Made of brass. Wishpower 1pc Fly Fishing Knot Tyer with Fly Fishing Line Clipper + 1pc Fly Fishing Zinger Retractor + 1pc Multi-Purpose Beer Opener Survival Card Tool for Fishing/Camping. 1pc Fly Fishing Knot Tyer with Fly Fishing Line Clipper + 1pc Fly Fishing Zinger Retractor + 1pc Multi-Purpose Beer Opener Survival Card Tool for Fishing/Camping. 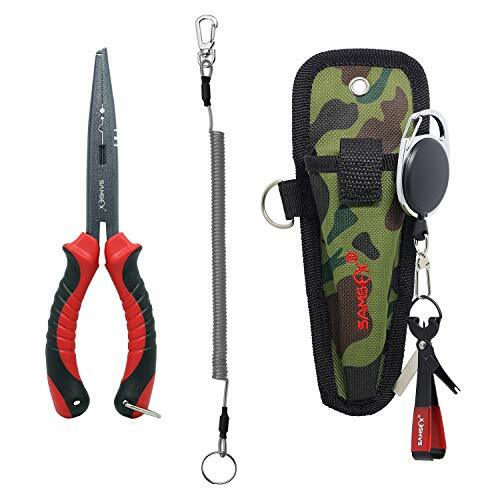 Features: ALL-IN-ONE TOOL FOR FISHING:1pc Fly Fishing Knot Tyer + 1pc Fly Fishing Line Clipper with Fly Fishing Zinger Retractor + 1pc Multi-Purpose Beer Opener Survival Card Tool for Fishing/Camping. Built in line clippers to cut excess fish line,Keep hooks sharp with built in sharpener,Tie your entire fly fish line with this tool,Clean your eye holes with the built in needle,Come with fishing zinger retractor, easy to carry. FLY FISHING KNOT TYER: Fish Line Cutter,Cut excess line. Knot Tyer,Quick nail knot tyer/Tying hook in time. Hook Sharpener,Keep fish hooks razor sharp,Fine grit sharpener/One fine groove design. Hook Eye Cleaner, jig eye tool,clear fish hook eye. FISHING ZINGER: Zinger Size: 65mm * 35mm / 2.5" * 1.4" (L*W), Nylon Cord Length: 600mm / 24". Material: Alloy frame, durable nylon cord, plastic body, 25mm / 1" length metal buckle. 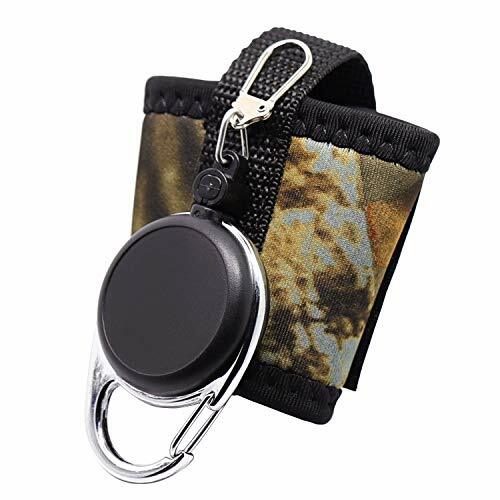 Muilti Use: Suitable for fly fishing, key rings, perfect for fly fishing tools for every angler, quick release hook for your fly fishing tools,good gifts to fisherman. SURVIVAL CARD TOOL: Can Opener, Cutting Edge, Flat Screwdriver, Ruler, Beer Bottle Opener, 4 Position Wrench, Butterfly Screw Wrench, Saw Blade, Direction Ancillary Indication (Water Compass), 2 Position Wrench, Keychain or lanyard Hole. The small survival tool could be used to save your life in emergency situations Great for use in disaster packs, emergency kits, bug out kits, and camping survival. 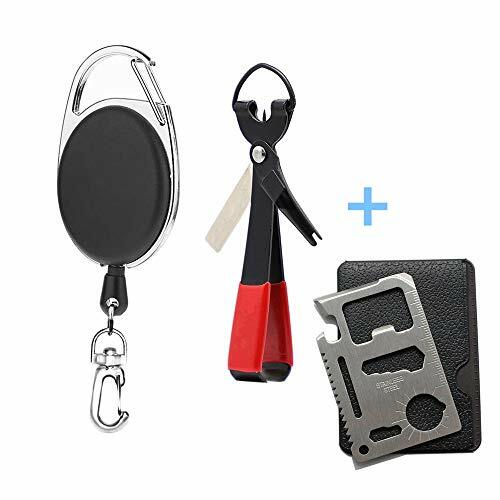 ALL-IN-ONE TOOL FOR FISHING:1pc Fly Fishing Knot Tyer + 1pc Fly Fishing Line Clipper with Fly Fishing Zinger Retractor + 1pc Multi-Purpose Beer Opener Survival Card Tool for Fishing/Camping. Built in line clippers to cut excess fish line,Keep hooks sharp with built in sharpener,Tie your entire fly fish line with this tool,Clean your eye holes with the built in needle,Come with fishing zinger retractor, easy to carry. FISHING ZINGER: Zinger Size: 65mm * 35mm / 2.5 * 1.4 (L*W), Nylon Cord Length: 600mm / 24. Material: Alloy frame, durable nylon cord, plastic body, 25mm / 1 length metal buckle. Muilti Use: Suitable for fly fishing, key rings, perfect for fly fishing tools for every angler, quick release hook for your fly fishing tools,good gifts to fisherman. WORRY-FREE WARRANTY: We offer 100% refund or replacement within 180 days and friendly customer service, which make your purchase absolutely risk-free. Measurement length: 100cm / 40"
Carabiner zinger: approx.10x4.0cm / 3.9x1.6"
Wrap straps: approx.17x6.5cm / 6.6x2.5"
The 3M Scientific Anglers Beluxe fly tying kit has everything needed to create effective dry flie, wet flies, nymphys, and streamers. 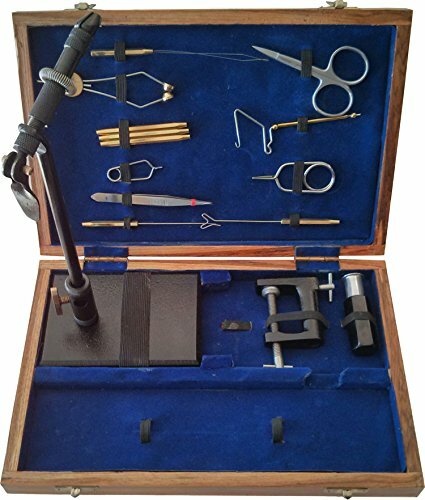 It includes deluxe fly tying vise, bobbin and threader, bodkin, hackle pliers and scissors, hooks, thread, tinsel, wire, dubbing, hackle feathers and marabou. 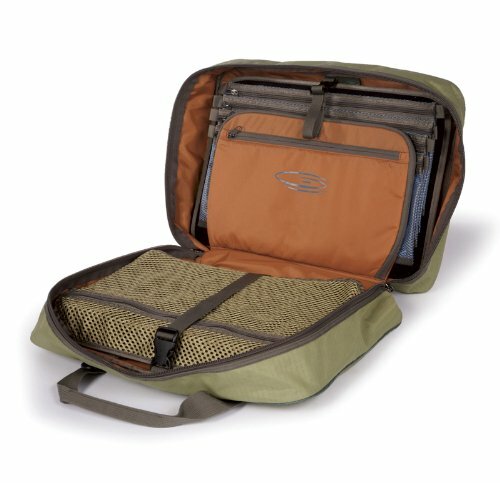 The travel case is great for tying on fishing trips. These mini kits are perfect to get anyone started with tying some serious flies for fishing. Enough materials to make dozens of flies. Kits contain 1 pack of strung saddle hackle, 1 pack of strung marabou, and 1 card of #2 medium sized chenille in corresponding colors.